The recent news about Meizu’s partnership with Canonical gave users high hopes that an Ubuntu-running Meizu phone would surface. However, BQ has beaten Meizu to the punch. Without waiting for potential contenders to make a move, the company has announced their Ubuntu phone before the MWC event next month. The BQ Aquaris E4.5 is the first Ubuntu phone, and has officially gone on sale. The E4.5 is equipped with MediaTek’s MT6582 SoC, with 4 processor cores clocked at 1.3GHz. Feature-wise, the phone does not blow away, but it is adequate. It will be sporting a smallish 4.5 inch screen with a qHD resolution display underneath. There is 1GB of RAM and 8GB of internal storage packed into the phone, with an option to upgrade the phone storage by microSD cards. The phone will only be released in Europe, and is therefore only rigged with European 3G network support: 900/2100 MHz. A 2150mAH battery will be powering the device. 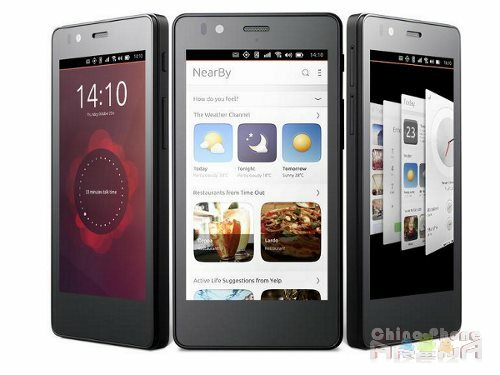 The phone will pull the user’s attention to the maiden flight of the Ubuntu OS. It will feature a Scopes interface, which learns from previous experience and incorporates user-specific content into themed panels. This interface aims to provide ease of access by flipping or swiping between panels, as opposed to searching for specific apps from the typical grid or drawer. There is still no news about global availability. For now, BQ is focusing only on the European market, and is selling the E4.5s, unlocked, for around $190.